The president of the Islamic republic of Nigeria, Muhammadu Buhari will never cease to display monumental ignorance when it comes to issues of self-determination with regards to the Biafra case. Times without number, Muhammadu Buhari couldn't come up with one tangible reason as to why he thinks those agitating for the sovereign state of Biafra should desist from doing so, except from the fact that the present generation of Biafrans craving for freedom were inexistent during the civil war of 1967-1970. On the 22nd of June, 2016, Muhammadu Buhari, while addressing the Federal Executive Council, during his break of Ramadan fast, stated that those who are agitating for the restoration of Biafra were not born during the war, otherwise they will not be towing same path as their forefathers. In his word, "Nigeria is a one united nation which can never be divided by anybody's selfish interest". Forty-nine years ago, over 3.5 million Biafrans were killed. And till date every Biafran still feels the effect of what led to the conflict and Nigeria being governed by haters of Biafrans, is yet to make life any better for both those that witnessed the war and those that were not born during the war. This new generation of Biafrans as the world can see have brought a unique perspective in their agitation for freedom, after analyzing the consequences of the past war. For many Biafrans, the Nigeria-Biafra war is over but doesn't mean they want to remain in Nigeria. It is noteworthy to mention that Biafrans were the first to fight in an African war that could be recalled with pride, as we had gallant men and women of great bravity that held on for three solid years, fighting a war of attrition with obsolete or no weapons at the time. War has always had a great effect especially on those who engage in combat, but the end they say justifies the means. During the civil war, our people were exposed to a lot of confusion, stress, diseases, pain and hatred, but they knew that life without Biafra was worse than what they were facing at the time, and regretfully, same thing is still happening in the present day Nigeria. Age, they say, is a thing of the mind and nothing but a number, the fact that Buhari witnessed the war doesn't make him any wiser than those who were not born during the war. Buhari's level of reasoning is frequently juxtaposed with a startling innocence geared towards deceiving and instilling fear in the present generation of Biafrans fighting same cause as their fathers against Nigeria as a whole. If only Buhari could come up with a logical reason as to why we should remain in this marriage of inconvenience, perhaps we would not be talking about this. If Buhari thinks Biafrans should not fight for their freedom simply because they were not born at the time, why then did he (Buhari) marry Aisha Buhari who also was inexistent during the war? If Aisha Buhari who was not born during the war was old enough to be considered ripe for marriage at the age of nine, even though we know that pedophilia runs deep in every Hausa-Fulani's vein, then Nnamdi Kanu who happens to be older than Aisha is old enough to lead Biafra from the failed contraption called Nigeria. Going by Buhari's nescient statement, as a presidential aspirant in 2003, 2007 and 2011, one would have expected him to resign to his fate/defeat after consecutively losing the elections under the banner of CPC party, but his obsessive desire for that power that kept eluding him spurred him on until he successfully rigged himself into the upper echelon of government. So why did Buhari not let go after failing once? Still on the issue of age, Is Buhari not aware that we have veterans who are still alive, older than him and part of this current agitation for Biafra? Their support and concurrence to this noble effort was evident on 30th May, 2014 heroes day in Enugu, when they handed over mantle of leadership to Nnamdi Kanu, for him to continue from where they stopped after much conviction that he is the only person fit enough to anchor this ship to its destination. Asking Biafrans to forget about Biafra just because they were not born during the war, could be likened to asking a child to discard his family name simply because he never met his progenitor alive. We may not have been born during the war, but we have been faced with more horrible situation than what led to the past war, learnt from the mistake of those that experienced the war, and we are not about to let that happen again. 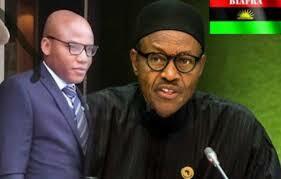 It is by no means an exclusive right of Buhari to ascribe Nnamdi Kanu or any genuine Biafran fighting for the restoration of Biafra as being selfish, because he [Buhari] is the most selfish creature that is currently roaming the earth. When you [Buhari] said that you will treat the 5% from Biafra land differently from the 95% that voted for you outside Biafra land, despite knowing that they are the bed rock of the economy, what do we call that? When you flamboyantly gave a nudge towards the freedom of the Palesinians, Western Sahara and stupendously praised David Cameron's statemanship for accepting the people's choice to exit EU, while you [Buhari] has vowed to jump into the ocean simply because Biafrans want the same thing, what do we call that? If that is not the height of hypocrisy and selfishness, then I don't know what it is. It is said that "what is good for the goose is good for the gander", but this proverb simply does not apply to Buhari as any impediment to retaining the aim [Crude oil and Islamization] upon which this estate of the Northerners [Nigeria] is founded upon must not hold sway for obvious reasons. Buhari must understand that age is not a factor where Biafra restoration is concerned, as long as every Biafran has the capacity to contribute their quota towards ensuring its successful restoration. It is imperative that the UN, Britain - the creator of Nigeria, and the world's attention is drawn towards the quest for the restoration of Biafra and support our call for a Referendum, just as other western countries have been obliged. We have not gone contrary to the tenets of the UN charter and we do not intend to. But if there is an impending conspiracy that is geared towards ensuring that Biafra doesn't exit Nigeria, then we will have no other option than to tow the path of our fathers who were formerly led with arms by Dim Chukwuemeka Odumegwu Ojukwu, but now under the command of Nnamdi Kanu.